Getting a college degree has become more and more important if you want to find a well-paying job in today’s economy. And unfortunately, college is more expensive than ever. But don’t get too overwhelmed. California has many programs geared towards helping you fund your college education—and you don’t have to be the valedictorian of your high school to qualify for most of them, either. Some schools offer extremely generous tuition assistance to students based on household income. In fact, students whose families make less than $80,000 may even be eligible to go to school for free. There are also many opportunities to gain financial support for college from external sources such as scholarships and grants. If you’re worried about paying for school, we’re going to help you through it, one step at a time. Before you think about scholarships or loans, you should apply for federal funding, also known as FAFSA, the Free Application for Federal Student Aid. Why should you apply for the FAFSA? Because the federal government gives over $150 billion every year to students like you who want to pursue a degree in higher education. While the FAFSA application can be tedious and is notorious for being confusing, we have a helpful guide to help you through each question. FAFSA can help you find some grants and scholarships that may apply to you, but there are plenty of others that you should also consider. Take for example University of California’s (UC) Blue and Gold Opportunity Plan, which gives full tuition and fees to students whose family income is under $80,000 per year. Similarly, the Middle Class Scholarship program covers up to 40% of some state school’s tuition and fees for middle class students (whose family’s income is between $104,001 and $156,000 or less per year). Also, the California DREAM Act gives undocumented students the opportunity to receive state aid. Army ROTC provides financial support for college for California residents who want to attend a CA school. The California Restaurant Association Educational Foundation Scholarship is awarded to high school students who have worked in the restaurant and hospitality industry. The California Association of Winegrape Growers Foundation Scholarship provides up to $8,000 to California students whose legal guardian is employed by a winegrape grower in CA. There are also many grants that are offered to California residents. Cal Grant for students who plan on attending a California State University (Cal State), UC or private institution in California. This grant can also be applied to tuition at occupational/career colleges. California Chafee Grant for Foster Youth gives up to $5,000 a year for students who were in foster care between the ages of 16 and 18. Law Enforcement Personnel Dependents Grant Program provides financial support to children of police officers, firefighters, and Department of Corrections and California Youth Authority employees. Child Development Grant is a program for students who are committed to working in child care and development. Make sure to look at the comprehensive list of scholarships provided by California Colleges—California’s official website to help students plan for college. If you are unsure where to start, browse through the California Student Aid Commission’s (CSAC) website, which is a great place to begin. The CSAC also provides Cash for College workshops, which are free workshop that provide help with applications for the FAFSA as well as for specific scholarships. You can sign up or check to see where the nearest workshop location is at their website. Searching for scholarships and grants can be difficult. It’s a good idea to talk to your guidance counselor about any that they are aware of that you might be eligible for. You can also go to the financial aid section of any college or university’s website which may lead to funding opportunities that are school-specific. Let’s look at UCLA, which has many scholarships dedicated to incoming students. Take for example the Gertrude Pomish Scholarship, a scholarship dedicated to supporting incoming freshmen who have participated in community service. UC Berkeley has a similar webpage that is devoted to scholarships. One scholarship, the Fiat Lux Scholarship, supports successful students from local high schools in certain areas throughout the state. Once you’ve completed steps one through three and are still in need of financial assistance for school, you might want to consider taking a private student loan. 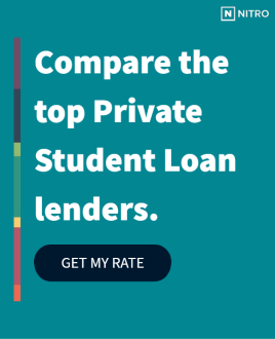 You can compare the lenders some of the best banks for a private student loan here. You can also use our NitroScore Tool which will give you a better idea as to how fast you will be able to pay off your student loans after college. With NitroScore, you can be more informed of your future finances. This may be a lot to take in but just think about how much more affordable college will be with all of these resources. And now, you are one step closer by checking out all of your options!